Are you looking for a unique and meaningful way to celebrate a significant moment in your friend’s life? It might be a milestone birthday, a wedding or pregnancy. Let us create a ceremony where we honour your friend with a tailor-made experience just for her, to celebrate this momentous occasion in her life. Surrounded by her close friends and family we’ll endow her with grace, bless her through art, meditation or dance, sip Champagne, savour canapés and enjoy an authentic connection with her in this personal special tribute, always to be treasured. Ceremonies go for 3 hours and are always unique and tailored to the individual. Gather together to acknowledge and honour your pregnant friend and nurture and bless her with a beautiful, meaningful ceremony before her baby arrives. Honour and support her, along with her friends, in a tailor made celebration. Perhaps choose a bead each and make a necklace for her, or give her the gift of her own belly cast, something she will cherish and remember for years to come. I was so touched by the whole concept of the ceremony… it was a wonderful way to connect with my unborn baby… at times I was close to tears it was so special… and my friends told me later they felt truly honoured to be there. Never having been to a Blessingway, I wasn’t sure what to expect. It was such a beautiful and moving celebration of our friend and the impending birth of her bub. Any uncertainty quickly gave way once surrounded by the warmth and positivity of all those amazing women in the room! 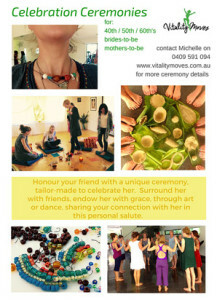 Please contact Michelle to talk about holding a ceremony.